I found out a few hours ago that today is National Chocolate Chip Cookie Day. Well, that is all the invitation I need to share this recipe with you; these chewy, buttery, chocolaty bars are what I think of when I crave a chocolate chip cookie. Sure, they are a bar, not a drop cookie, but that just makes things easier! No mixer needed, one pan instead of four cookie sheets, and they bake in a flash– that’s my kind of dessert. 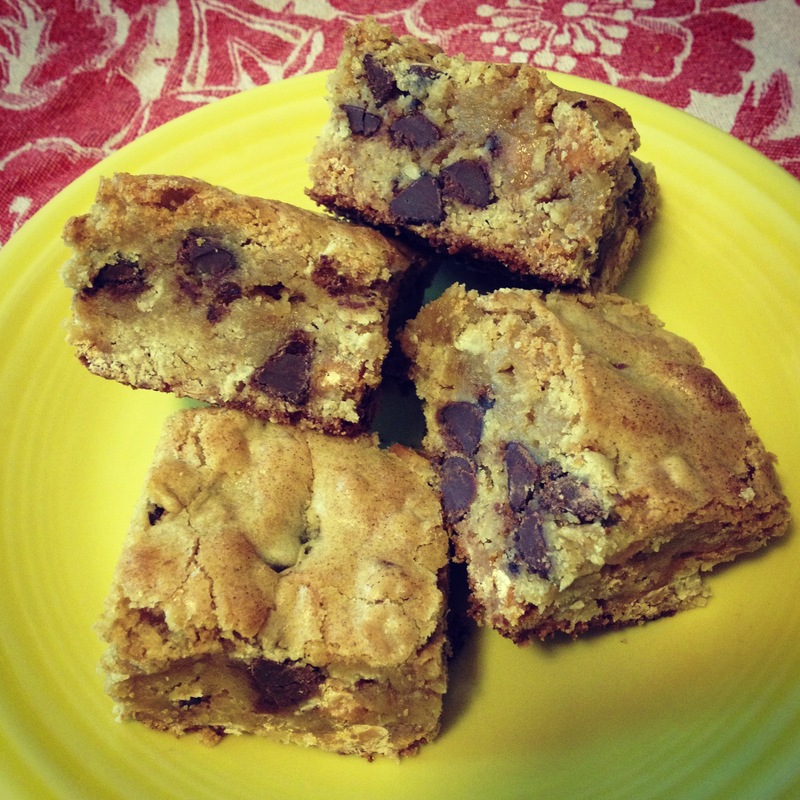 This recipe is an adaptation of one for Congo Bars my Mom has been making since I was a kid. I am not sure where she got it originally, but such a classic bar cookie has surely been popular for years. Though I love and still make her recipe, I made some changes to give a new spin to the Congo Bar. For my version, I cut out some sugar, replaced about a third of the flour with oatmeal– I like the chewiness it provides– and added a handful of butterscotch chips. The combination of chocolate and butterscotch reminds me of another favorite from childhood, the Scotcharoo. Chippy Cookie Bars are crowd-friendly, since the recipe makes about 48 bars, or can be frozen in smaller batches. If you want to bake a smaller batch, cut all the ingredients in half (use 2 eggs instead of 3) and bake in an 8″ square pan. No butterscotch chips on hand? No problem– just leave them out or replace with an equal amount of chocolate chips. My husband has requested a batch made with peanut butter chips in place of butterscotch, and I will be happy to oblige. If you have the ingredients on hand, consider making a batch of these bars tonight– there’s still time to celebrate National Chocolate Chip Cookie Day! Preheat the oven to 350 degrees. Grease a 9″ x 13″ baking pan and set aside. In a large saucepan over medium-low heat, melt the butter; remove from the heat as soon as it has melted completely and mix in the brown sugar. Cool the mixture to room temperature and then whisk in the eggs and vanilla. To the butter mixture, add flour, salt, baking powder, oatmeal, chocolate chips and butterscotch chips, if using. (Adding the chips at the same time as the dry ingredients coats them slightly with flour and helps ensure they won’t all sink to the bottom of your cookies during baking.) Mix by hand just until the dry ingredients are incorporated; pour your batter, which will be thick but somewhat viscous, into your greased pan and spread evenly. Bake for 25-30 mins. (27 mins. is perfect in my oven) and remove. The skewer test doesn’t really work on these gooey bars, but the top should be firm and golden brown and the bars will look set. Cool completely before cutting. Bars will keep covered at room temperature for several days and will freeze in Ziploc bags or a tightly-covered container for about three months.